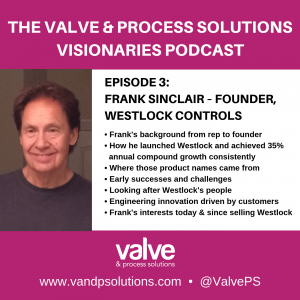 Frank Sinclair is a legend in the Valve and Process industry and it was a privilege to interview him for the VPS Visionaries podcast. In this episode, Frank explains his background before Westlock and what sparked his decision to set up the business. He covers Westlock’s first beacons, early successes, failures and challenges. He explains how the Westlock switchbox came about and what made it commercially successful. and his activities in life and business since. Enjoy these insights from a true pioneer in the industry. As the world’s leading stockist and leading distributor of Westlock products VPS has a lot to thank Frank for. We found Frank’s tales absolutely fascinating and we’re sure you will too. Sign up to the VPS newsletter to ensure to get notified of new episodes of our podcasts, educational updates to keep you informed, new developments in the valve and process industry – and much more. Full details here. Episode two with our own Steve Pearson is here.